As soon as you see the name TokyoFlash you probably think crazy watches… this time it’s a crazy clock that has been created although it’s not that crazy and looks very cool. The Blue LED Mesh Clock is the name of it… more after the jump. The Mesh Clock has blue LED’s just behind a black mesh which let the time glow nicely. Hours are represented at the top of the cylinder while minutes and seconds are below that. 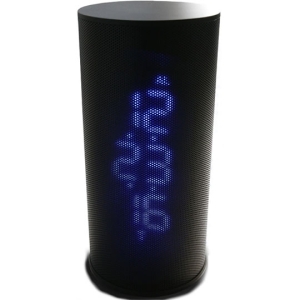 The Blue Mesh LED clock has a radio built in and the time is also set automatically. It is powered by an AC adapter that works in any country thanks to a converter. If travelling you can also opt to power it by 3 AA batteries. The Idea International Vertical Mesh Clock measures 16(H) x 7.5(W) centimeters and the products is available from the Tokyoflash website for $118. Any word on the alarm feature on this? I would be pretty cool if the back had a pretty decent size speaker for the alarm clock. No details of that feature really except for that it exists :S I’ll keep an eye out for more details as it could potentially be a rather nice speaker.